Artsploitation to Release Surreal Eurothrille.. 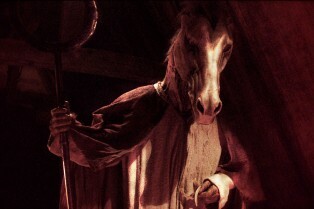 Fantastic Fest: Horsehead is a Silly, On-the-.. Fantastic Fest 2014 Wave 1 Films Revealed: Tu..
Sure, there’s a trailer for the new Transformers film that is gobbling up everyone’s attention, but may I point you to a little something different? Something that is NSFW and plays like a fever dream? It’s for a film called Horsehead and it comes to us from director Romain Bassett. Genre vet Catriona MacColl (The Beyond) co-stars. The film is playing to potential buyers at Cannes. Check out the promo below.